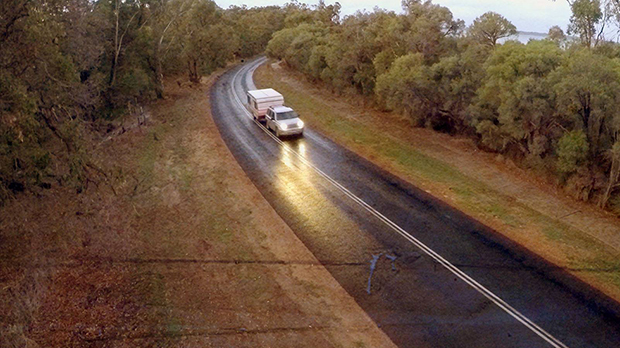 Together with director Nathan Lacey, fledgling Perth producer Sarah Brims is currently planning their next project, Caravan, a short horror film that takes the concept of home invasion on the road. Brims and Lacey met when they both worked on the Perth-shot indie feature, Broken Contract. Since then, they’ve worked on a number of projects together, including trailers and a music video, but Caravan is their most ambitious. “Caravan is basically a home invasion movie,” Brims explains. “But it’s set on the road in a caravan. Basically think The Strangers, but in a much more confined space. We think that nothing like that has been done before, so we’re really excited to work with a concept like that. We’re also using the urban legend behind the movie, When A Stranger Calls. We thought that could be really cool, using radios and walkie talkies in the caravan, with the parents up front in the car, we could play around with that. You know when you were a little kid on Christmas and you’d get those walkie talkies, the crappy little ones? We’re using those for the kids to communicate with the parents. Initially, Brims and Lacey sought funding through FTI’s Raw Nerve initiative, but as Lacey had received funding last year for Pale Date, a short he wrote, directed and produced, they were ineligible. “I thought, okay, we’re gonna have to go through another funding avenue. So we’ve got a couple of private investors attached to the film and we’ve also put up a crowd-funding campaign to help the film look really professional. We do want it to be a really classy, slick horror film.” Their campaign is currently live on Pozible.